In mid-December, twin discs will begin glowing blue on the underside of a minibus-sized spacecraft in deep space. At that moment Europe and Japan's BepiColombo mission will have just come a crucial step closer to Mercury. Their first routine firing is scheduled for the middle of next month, and the propulsion system will operate continuously for three months to optimise the spacecraft's trajectory for the long voyage to Mercury. 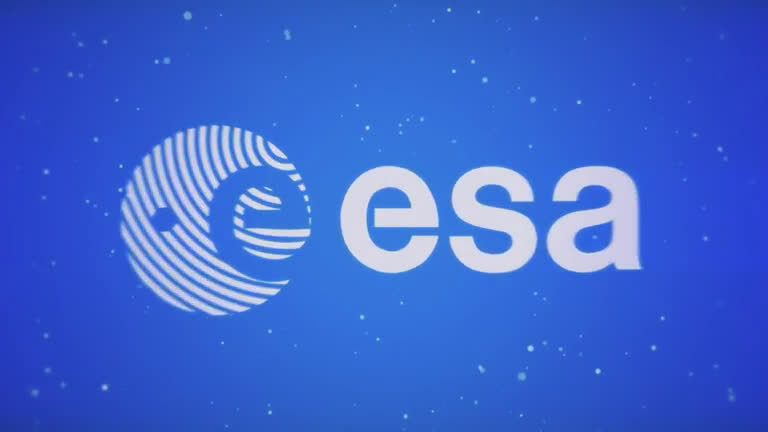 BepiColombo, launched from Europe's Spaceport in French Guiana on 20 October, faces a different challenge from ESA planetary science missions before it: it is headed inward, toward the Sun, not out, and needs to lose velocity instead of gaining it. Like all objects in the Solar System, the spacecraft is in solar orbit, moving perpendicular to the pull of the Sun's gravity. BepiColombo therefore has to slow down through a series of braking manoeuvres and flybys, making it more susceptible to the Sun's gravity and letting it spiral closer to the heart of the Solar System. 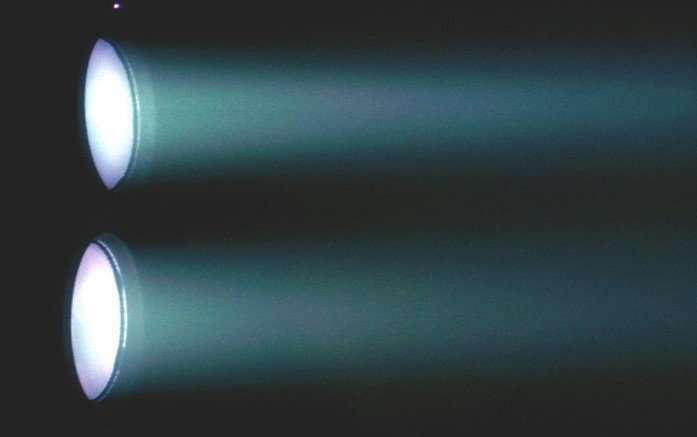 The thrust produced by the electric propulsion system serves to decelerate the spacecraft, or in some cases accelerates it to make its braking flybys more effective. No less than nine planetary flybys of Earth (once), Venus (twice) and Mercury itself (six times) are required to place the multi-module spacecraft in orbit around Mercury in seven years' time. The Mercury Transfer Module portion of the spacecraft, containing the propulsion system, is in essence a high performance 'space tug'. Its task is to perform all the active trajectory control manoeuvres needed to convey the other portions of the BepiColombo 'stack' – ESA's Mercury Planet Orbiter and Japan's Mercury Magnetospheric Orbiter – to Mercury orbit. 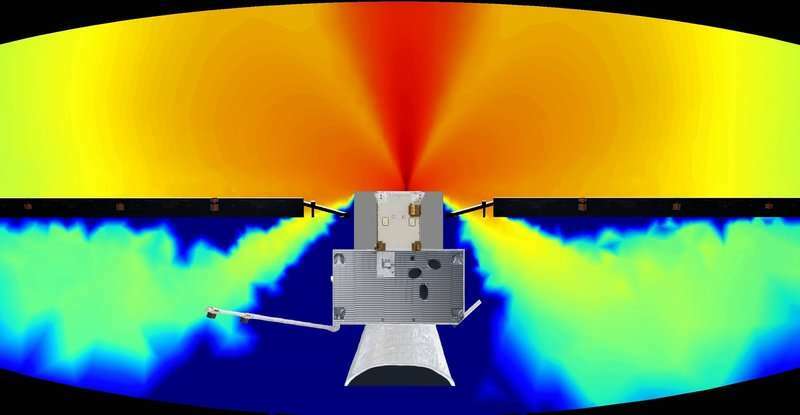 "The propulsion system transforms electricity generated by the Mercury Transfer Module's twin 15 m-long solar arrays into thrust," explains ESA electric propulsion engineer Neil Wallace. "At full power, a thrust equivalent to the weight of three 1-euro coins is developed, meaning that the thrusters have to keep firing for long periods to be effective, but in the absence of any drag and assuming you are patient, the manoeuvres that are possible and the payload that can be carried are dramatic." The first flight of their technology came with the 10 cm-diameter T5 thruster, a key element of ESA's 2009 gravity-mapping GOCE mission, where it allowed the satellite to orbit at the top of Earth's atmosphere for over three years, skimming through the diffuse atmosphere at the unprecedentedly low orbital altitude needed for the mission. The scaled-up T6 thrusters are 22 cm in diameter, the increase in size required for the higher thrust and lifetime requirements of the BepiColombo mission. And unlike GOCE's T5, these T6 thrusters are manoeuverable, courtesy of gimbal systems developed by RUAG Space in Austria. "They are clever mechanisms that complicate the system design a bit – all the electrical cables and pipes have to cross a moving boundary – but add a lot to performance," adds Neil. "They ensure the thrust vector of either a single or double engine firing crosses through the centre of gravity of the spacecraft, which changes over time as propellant is used up." 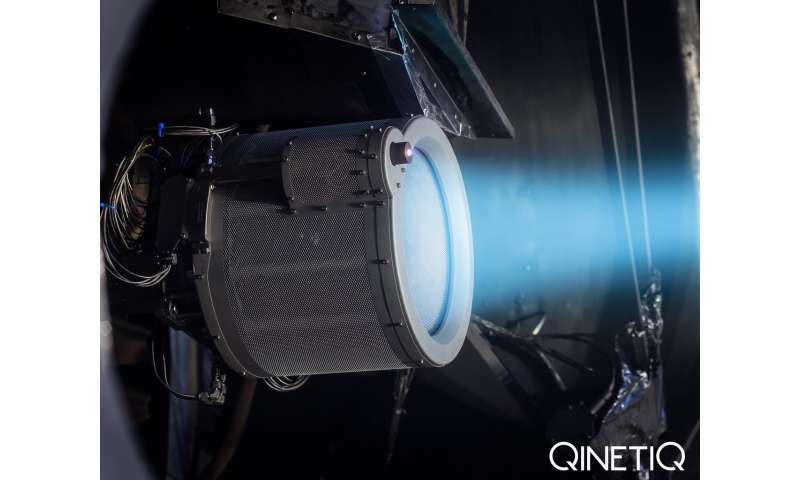 "The intelligence of the system for autonomous thruster operation comes from these Power Processing Units – contributed by Airbus Crisa in Spain," explains Neil, "which supply the regulated voltages and currents to the thrusters based on instructions from ground control via the spacecraft on-board computer." "One important test early in the programme was to ensure that two thrusters could be operated in close proximity for prolonged periods without harmful interactions," adds Neil. "They turned out to be remarkably tolerant of each other with no measureable effects." Neil explains: "Despite the fact the mission is headed to Mercury, the bulk of the spacecraft shadows the thrusters for very long periods and when not operating they naturally cool to temperatures way lower than ever tested in the past. We needed to prove they would turn-on and operate within specification when cooled to minus 150 C.
"It was a remarkable testament to the robustness of the technology that even after temperatures sufficient to freeze the xenon in the pipes the thrusters were able to start and operate flawlessly." The propulsion system is dependent on the Mercury Planetary Orbiter's onboard computer for its control and command, so by itself it will not be able to function. 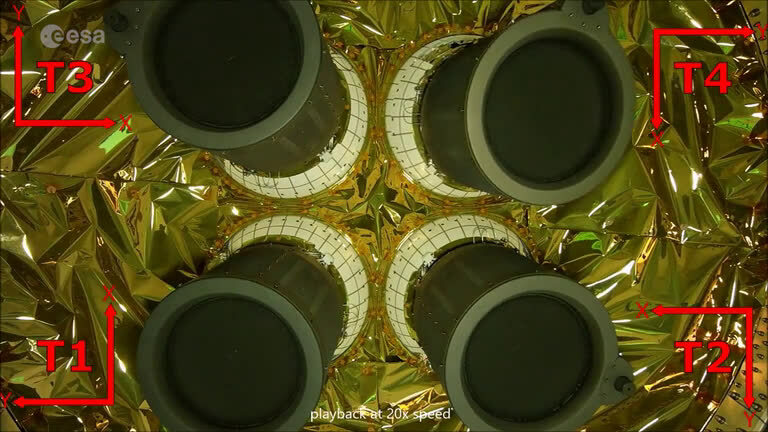 Its ultimate fate is to be cast off, when the three-module BepiColombo stack separates before entering Mercury orbit, to circle the Sun indefinitely in the vicinity of the planet, letting the two science modules go to work. 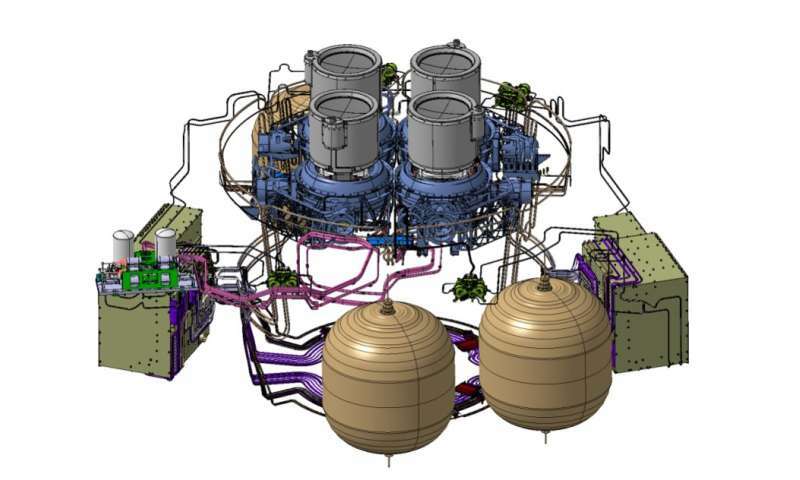 "At one point while planning the BepiColombo mission, the Mercury Transfer Module was planned to impact the planet," Neil comments, "a sort of Viking funeral that seemed fitting to all of us engineers." What's the deltaV for the spacecraft? Are we supposed to deduce the weight of a Euro coin from the thrust in milliNewtons? The google-fu is weak in this one. Well somebody knows how to use the internet. But I wouldn't be feeding lazy trolls who come here asking others to do their research for them. "Well somebody knows how to use the internet. But I wouldn't be feeding lazy trolls who come here asking others to do their research for them." Aren't science reports supposed to provide relevent information, or should every report in Physorg add "google it yourself" in order to save space?